Are you ready to calm your overthinking mind, be free from the burden of worry, and feel light, confident and joyful? Are you exhausted from taking care of everyone and everything while your own needs are overlooked? Do you feel stressed, trapped, weighed down by worry and a slave to your busy, overthinking brain? Do you want to feel lighter, confident, more free, and more at ease with yourself? Are you tired of juggling all your responsibilities and worrying what everyone else is thinking? Do you feel like you’re missing out on the fun in your life and life is passing you by? Are you ready to calm your overthinking mind and start living the relaxed, free, joy-filled life you want and deserve? I’m a certified life coach and I’m here to guide you through the overwhelm and stress, to break loose of the worry burden and to feel free, calm and confident to thrive in your life. The ability and the answers lie within you and we will shine a light on them, plotting a way forward together. I want you to live the life you want and deserve, free from the pressure of overworry. You don’t have to carry this burden alone any more. Together we will work through your specific sticking points and create an inspiring plan for you to spend less of your time, energy and brain power overthinking, and instead live your life with calm, joy and confidence. 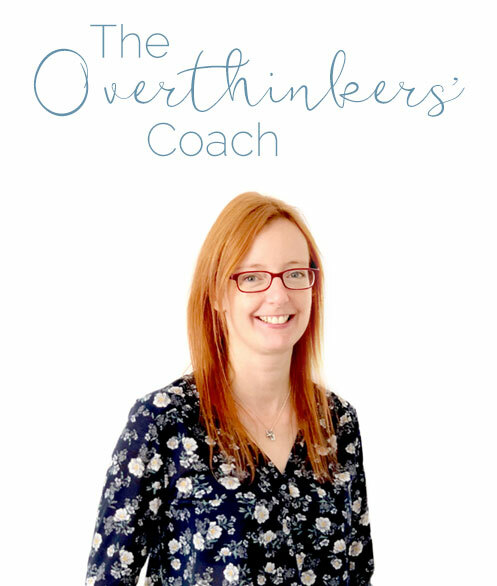 As well as freeing you from overthinking my coaching will inspire you to make new connections, take advantage of opportunities, experiment with how you spend your time, explore your potential and discover a world of possibilities opening up to you. “Gabrielle is a wonderful life coach. I could not have asked for a more supportive person to work with me at what was a difficult time for me. I never knew how much work I needed to do on myself before my eyes were opened fully. Through coaching with Gabrielle I feel more confident about who I am and what I need. I am happier, look at things in a calmer and more peaceful way and haven’t let myself get so emotionally upset with various life events. I feel like I can breathe properly, like a weight has come away from my shoulders and I can fully let that internal sparkle shine through. It can feel like no-one else in the world really knows what it’s like to have a million thoughts and what-ifs running through your brain at a million miles an hour. I know, I’ve been there. You don’t have to struggle alone any more. If you feel ready to make changes I’m here for you every step of the way. Take a look at my three coaching packages below to see which feels right for you. Your investment is a one-off payment of £650 or 3 monthly payments of £220. Your investment is one payment of £180. Your investment is a monthly payment of £195 for as many months as we work together (minimum two months). That’s no problem. You can either book yourself in to my calendar for a quick chat on the phone, where we can talk over what kind of support you’re looking for, or you can send me an email. “Gabrielle is a truly wonderful coach. I felt fully supported, seen and heard from start to finish. I feel more sure of myself now than I ever have in my life. “Gabrielle created a space in which I really felt I could open up and be honest. She fully heard and understood what my struggles were and I felt supported and confident working with her. The environment she created, along with powerful questions and insightful reflections, led to some real ah-ha moments. Tips and tools to explore between sessions were thoughtfully suggested and were a real highlight of the series. Gabrielle expressed her belief in me and recognised the progress I was making each session – this was invaluable and kept me striving for my goal even through the tough times. How do you know what it’s like to be an overthinker? For most of my life I lived in my head – overthinking, rehashing the past, what if-ing the future and thinking that if I could just keep control of all that’s going on everything and everyone would be okay. And then, things changed, I changed. I’d had enough of feeling stuck in my head and I was done with overthinking everything. I wanted to feel freedom in my life and I was ready to take action (read my About page for more). So, I learned how to untangle myself from my thoughts, to soothe my worrying brain, to feel calm, light, less stressed, to deal better with challenges and to really participate in my life, feeling more joy each day. I’m still a deep thinker. I still care greatly about the people and world around me. There are times when I catch myself what if-ing but it’s okay because I can recognise when it’s helpful and, most importantly, when it’s not, and I know how to help myself before my brain spirals off into an overthinking whirlwind. How and where do the coaching sessions take place? Our coaching sessions are held on Skype which means you can be anywhere in the world! We talk face to face, over the internet, and I record the audio of our sessions and email you the mp3 so you can listen to it again whenever you like. We also stay in touch by email between our calls. Coaching is different to therapy and counselling in a number of ways. Therapy is more focused on diagnosed anxiety disorders and within sessions you may investigate causes for the anxiety, looking back to the past for explanations. Coaching is very much about looking forward and you, the client, taking positive action steps towards the life you want without needing to explore the past. With coaching we set goals for how you want to feel and be, and actions to keep you moving towards the goals. As your coach I ask powerful questions, listen, inspire, I hold you accountable, explore what’s coming up for you as the client and support you to stay in positive action. I may make suggestions, provide resources and support but I don't give instructions or tell you what to do. Coaching is very much about empowering you the client to self-actualise and do the work to keep the momentum going to move towards your goals. If I choose the Flow package how long do we work together for? The Flow option doesn’t have a set end date. We have two coaching sessions a month, for two months, to begin with and then we can keep coaching together with two calls a month for however long it feels supportive to you. This is a flexible option if you’re looking for ongoing support. “I chose to do coaching with Gabrielle due to her years of experience in positive psychology and through following her advice and tips regularly via Instagram and Facebook. I knew her positive, friendly and professional approach would be one that would work for me and one that I could trust which I think is really important when opening yourself up to coaching. “Having someone to be accountable to made all the difference to me and my motivation was spring-boarded! I overachieved on my goal and made lots of progress on the surrounding actions. I also felt a greater sense of purpose within our busy family roles (ie not just a mum taxi and chef). I’m a certified life coach having completed training with the Beautiful You Life Coaching Academy and positive psychology coaching with the Wholebeing Institute. I am committed to ongoing professional and personal development, and I work regularly with a coach too.